MNP’s Digital Acceleration Platform (DAP) can save you time and money by centralizing your finance and operations into one cost-effective, convenient and easy-to-use platform. By combining leading professional insight with your financial management and technology needs, you get a tailored cloud-based solution that is scalable for your growing operation. No more coordinating with multiple vendors. No more wrestling usable insights from programs that refuse to integrate. Now you can have everything you need, when and where you need it. Regardless your business’ size, industry or stage in the growth cycle – you need a digital strategy that provides clear guidance, delivers actionable intelligence and empowers you to do what you do best. 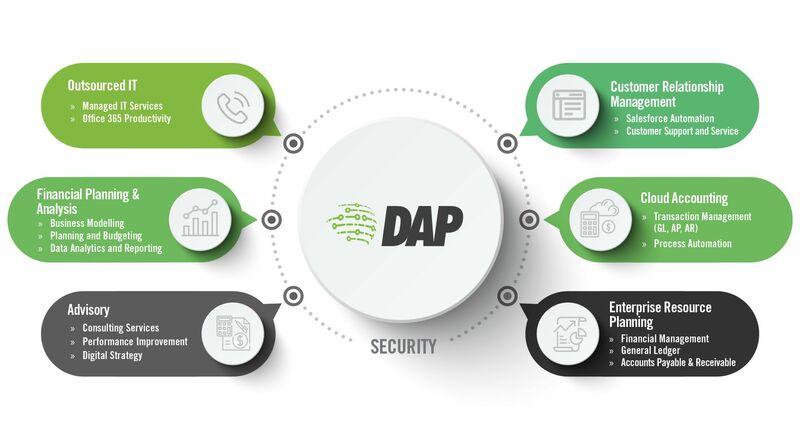 By focusing on three key pillars, DAP will optimize your performance and ensure you get the most value from your business now and as you grow. You need to see the whole picture to truly understand your business. From the largest trends to the smallest transaction, every insight is critical to making the right decisions at the right time. Your business deserves your full attention. Time spent inputting information, reconciling data and coordinating with vendors is time better invested honing your strategy and leading your people. Technology is a strategic asset, not a cost centre. Whatever you invest must add value by reducing the total cost of sale or driving tangible, actionable and insight-driven outcomes. With stewardship services from an MNP advisor, you’re no longer in it alone.